When Mexico City was hit by a magnitude 8.1 earthquake in 1985, disaster response teams searched the same buildings over and over again. During search and rescue efforts for the 1986 El Salvador earthquake, two European rescue teams clashed over the appropriate approach. Twenty years ago, international search and rescue was "very chaotic indeed", said Joe Bishop, an emergency management consultant. "It was a free-for-all, there was no commonality at all... the tools were totally inappropriate for the job, all to the detriment of the affected people." That changed with the development of the International Search and Rescue Advisory Group (INSARAG) 20 years ago in December. "I think there's still a lot to be done, but we've made major inroads since the earthquake in Mexico in 1985," said Bishop. Jens Kristensen, a UN official who was rescued from the rubble five days after the 12 January 2010 earthquake in Haiti, agreed: "INSARAG has come a long way in 20 years." The international response to the Haiti earthquake was the largest ever. "The best outcome," observed Kjell Larsson, a senior adviser to the Swedish government, "was that the USAR [urban search and rescue] teams saved more lives than any other earthquake response in the past 10, 20 years." Nihan Erdogan, a humanitarian affairs officer with the UN Office for the Coordination of Humanitarian Affairs (OCHA) and Haiti United Nations Disaster Assessment and Coordination (UNDAC) team member, said the search and rescue operation in Haiti "allowed INSARAG to learn significant lessons". 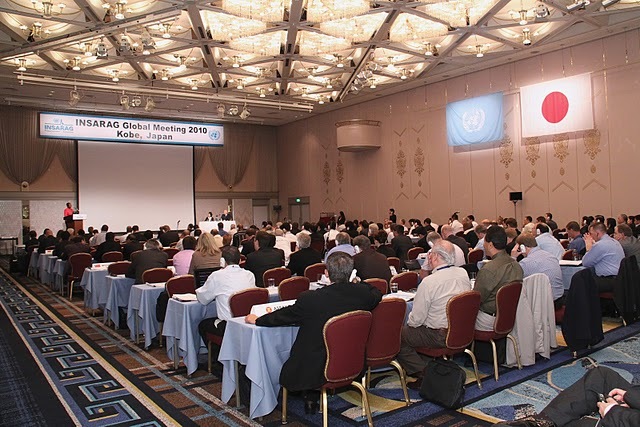 INSARAG held its first global meeting in Kobe, Japan, in September, linking up 200 participants, 79 countries and eight international organizations. Co-organized by OCHA, the meeting launched celebrations for INSARAG's 20th anniversary and commemorated the 15th anniversary of the Great Hanshin earthquake in Kobe. Erdogan believes the main achievement of the meeting was the INSARAG Hyogo Declaration, which was adopted by all participating member states. The next step, said Erdogan, will be the implementation of "a common understanding and common strategy [which] will make a big difference at the operational level". Erdogan suggested the biggest lesson for INSARAG over the years has been to have minimum international standards. Referring to her experiences in Haiti, she said: "It was challenging to coordinate the USAR operations while teams had completely different opinions and approaches to security measures." On 16 December 2002, General Assembly Resolution 57/150 endorsed the establishment of international standards and USAR capacity-building with the aim of improving the efficiency and effectiveness of international search and rescue operations, but a remaining challenge has been the certification of qualified international USAR teams. One measure that has already been introduced to address this gap is the INSARAG External Classification (IEC) process, established in 2005 to identify competent USAR teams. "Haiti was the first big disaster using the classified teams," said Erdogan. In light of Haiti, "now we know very well that IEC worked very well". Yet out of the 60 international USAR teams that responded to the Haiti earthquake, only eight were IEC-classified. Larsson noted that "it's a fairly costly process ... and it's a fairly slow process". It can take years for an international USAR team to complete the classification process, Erdogan said, and the queue to qualify for IEC classification extends to 2014. Once a team has been classified, "we speak the same language and do the same thing", Erdogan said. Mariusz Feltynowski, leader of a USAR Poland classified team, said in a review of the Haiti response that "cooperation with other certified teams was almost faultless. This happened because teams worked with the same standards, similar equipment and mainly because they knew each other." Another lesson that has emerged is the need to strengthen capacity at local, national and international levels. Because of time and distance issues, at least 48 hours can pass before an international rescue team arrives at an emergency. "If we can spread out the methodology through all levels and layers of response, we can save more lives," said Larsson. "If the national teams are trained, they can come together and work better with the international teams in a rescue operation." INSARAG now aims to classify national teams. Toni Frisch, INSARAG chairman, noted that "[w]hile the benefits of the INSARAG External Classification process in ensuring minimum international operational standards and matching needs to capacity were amply demonstrated in Haiti, the importance of introducing similar minimum standards and methodology at the national level became abundantly clear as a key to better preparedness for earthquake response". Yet another lesson addressed at the global meeting in Kobe was the "beyond the rubble" concept. Using the analogy of a local fire and the response carried out by a local fire department, Larsson noted that the firefighters do not simply show up, put out the fire and then leave. There are procedures in place for after the fire, such as relocating victims, dealing with trauma, and so on. He said there was room for improvement in this post-disaster phase. During this period in Haiti, the expanding role of the USAR teams was seen to add value to overall humanitarian assistance. They assessed the safety of vital public buildings, recovery of damaged equipment and collection of the deceased. The recognition of this reconstruction "beyond the rubble" has become an important aspect of how USAR teams will think about future responses to disasters. A typical international USAR team includes search, rescue and medical components as well as administrative and logistical support and can be deployed within eight hours of notification of an emergency. A medium team consists of 20-60 people and a large international deployment can comprise 80 to 100-plus. "Dogs spearhead most of the search operations," said Bishop, but structural engineers, vets and medics are also needed. A team can remain in operation for 10 to 14 days before being resupplied, but the operational effectiveness for life-saving has a limited window of about four days. "The survival rate dramatically drops after four days," he said. "Ninety percent of the rescues are done by locals, [while] international teams deal with deep penetration protracted rescues." A senior humanitarian official said it was "crystal clear" that nations gained positive visibility in the media from their USAR teams. In addition, it was a good way to hone skills and develop the "real-life" experience for use at home. Yet as Bishop pointed out, "These teams deploy gratis. It doesn't cost the affected country a single cent. The prime mover is that they are doing humanitarian relief. "The investment that they are making in vulnerable countries is the right investment," said Bishop. "Equipment, training and maintenance costs would be unsustainable in many countries." And while there is "nothing stopping a do-gooder or a nice john from showing up with a dog and a shovel... the INSARAG family is working toward filtering [out 'disaster tourism']," added Bishop.